A Very Awesome Purim brings the hit franchise to Brooklyn; a hilarious musical comedy telling the Purim story in the style of The Fab Four! Doors open at 7:30PM. Wait, so you drink like it's St. Patrick's Day, dress up like it's Halloween, and get to be part of an interactive musical? What is this? It's Purim, of course...the most underrated of all Jewish holidays. You do not need to be Jewish or know anything about Purim to attend this Purim party. This is a celebration for everyone. 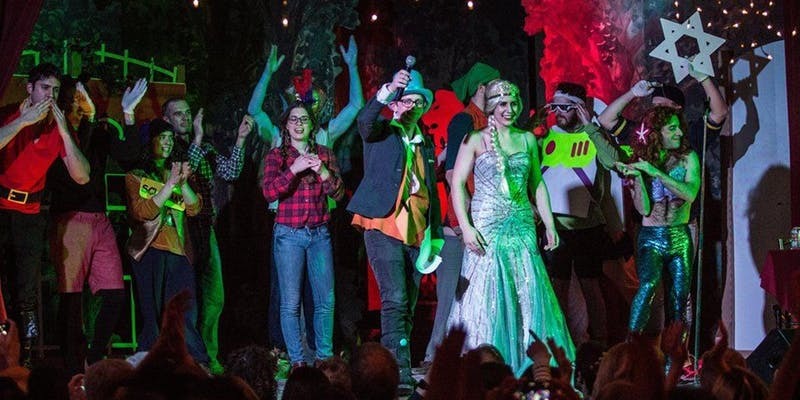 A Very Awesome Purim is an interactive musical and after-party started in Philadelphia, and we’re excited to be making our Brooklyn debut! With help from our awesome fans, we choose a genre—this year: Beatles—and reimagine the Purim story every year. There’s a drunken king, an evil prime minister, and a brave queen who saves the entire Jewish population. The production strikes a careful balance of off-color humor, on-key parodies, and surprisingly poignant lessons about cultural acceptance. This is what you can expect from the night: An interactive musical featuring parodies of your favorite Beatles songs. Drinking! In Purim tradition, you're supposed to drink until you can't tell the difference between the good guy and the bad guy in the story. (It’s not difficult.) A costume party. Dress to the theme, or any costume will do. There may even be a reward for the best-dressed... A boisterous sing-a-long. From "Hey Jews" to "Good Day, Shushan" we've got the best of the Beatles with some hamantaschen flavor and plenty of surprises along the way. The greatest party of the year. We might be biased. Guess you'll have to find out. L'Chaim! This Year’s Theme: Beatles! Past themes include Broadway (2018), Disney (2017), One-Hit Wonders (2016), Glam Rock (2015) and 90’s (2014).